Spring is without a doubt my favourite time of year in London, it tops all other seasons and becomes one of the most 'Instagrammable' locations in the world. Cherry blossoms and magnolias line the streets but only for a couple of months if we're lucky, soon the petals fall and turn into a gooey brown mulch, Summer is coming. I often have a moment of pure appreciation for this city, my city, and last weekend was one of them. The weather was beautiful, textbook Spring sunshine and a temperature warm enough to warrant 'no jacket' attire. I made the most of this weather as it's often short-lived by breaking out my new pink velvet loafers. You will all know by now that when it comes to colour I tend to air on the side of, well, the neutral scale so for me wearing pink is a pretty big deal. 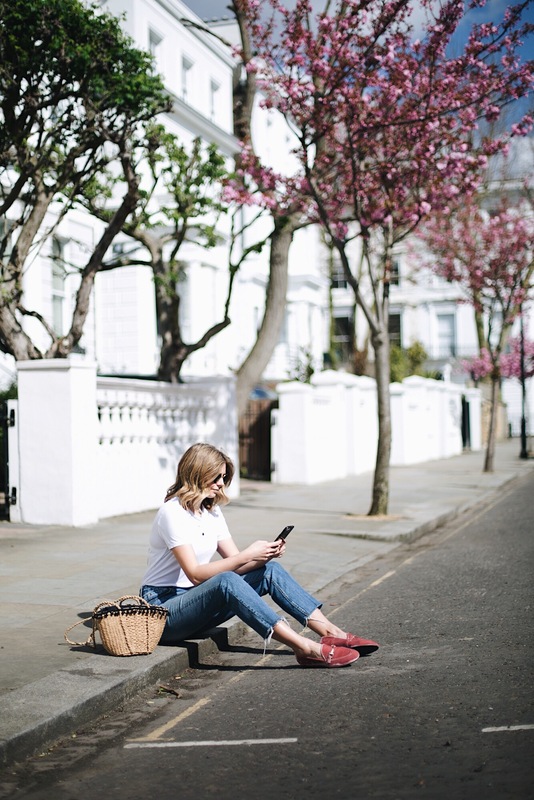 Matching my footwear to the cherry blossoms I stepped out in a basic white t-shirt, frayed hem jeans and of course, THAT Zara basket bag.